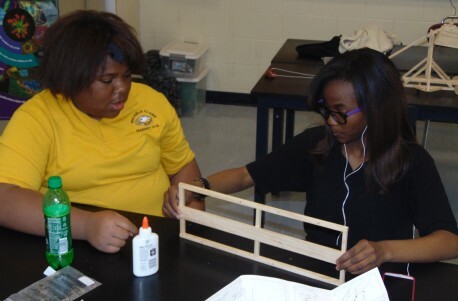 Kadeijah Bailey and her science partner Nya Mitchell were a little behind their classmates in finishing up their after school project – building a small wooden catapult. The two girls and another other group of Michele Clark High School students were going to see whose catapult could launch an object the farthest. The two teams would have to wait for another day, though, as they ran out of time to finish putting them together. In another classroom, Raheem Carter, 17, was gathering up the robot he built, which runs by remote control and can also pick up small objects. Carter, a junior, drove the mobile prototype robot through the halls. He’s been involved since his freshman year in the school’s vex robotics program. “It was cool to be in a robotics team, we did a lot of stuff,” said Carter, who also has a knack for technology and engineering, his teacher, Michael Williams, added. Williams oversees the school’s STEM (Science, Technology, Engineering and Mathematics) initiative. Many high school and middle schools nationwide have adopted STEM. Michele Clark became a STEM school three years ago. Students are recommended by their teachers or volunteer for STEM, which is funded through the state and includes university partners. Adult volunteers also work with and mentor students. Williams, who’s one of the school’s science teachers and has a PhD in the discipline, recalled being apprehensive when asked to oversee the program. “My background was more science than engineering or building anything, so when they asked me to take it on I was like, ‘Nahh, I can’t do this,'” he said. STEM schools also participate in academic competitions with other schools, like the annual city-wide Vex Robotics competition each spring. Students take their pre-built robots to the competition held at a participating school. Their robots compete against one another in a large play field – like a gladiator ring – where they must perform specific tasks for points, like picking up things or climbing over objects. Michele Clark has participated the last two years and will again this year. Michele Clark’s STEM program is split into two components: engineering and science. Vex robotics is under engineering, while activities like the catapult building is under science. The students on this day were building trebuchets, a catapult used during ancient times where a counter-weight is use to slingshot a projectile. About two dozen students are currently involved in STEM at Michele Clark. Williams said participation has varied since the program started. The high school, he said, calls the program STEMterprise. Their other projects include working with advanced LEGO-style robots that move on voice command, and measuring climate and other environmental conditions using different types of fish in large tanks. Williams said they’ve also built robotic submarines and will soon be constructing drones that fly via remote control. The students meet twice a week after school during the spring. Williams said the school would like to get more students involved, especially girls. Stefany Howard, one of the STEM teachers, recalled working with a group of girl students called GEMS – Girls in Engineering, Math and Science – last year. “My girls came in and the year before had built solar water heaters, and they built it from scratch from their own design. With the GEMS program, it was all trial and error for them building the solar water heater, so it kind of got them engaged and they were so psyched about that,” Howard said. STEM teacher Steven Woods said he gave some of his struggling students an opportunity to participate in in hopes of getting their grades up. Williams said he’d next like to build an outdoor nature center with foliage and green space for science projects under STEM and participate in more science competitions. “We’re just overseers and kind of like facilitators, but once the kids get into it, they’re the ones that really get it going,” he said. Dance and engineering classes are starting at the building the used to house May Community Academy before it closed in June. But the popular drumline isn't continuing because of lack of funds. The state-of-the-art fitness center center was built and funded by Optimum Nutrition and Lift Life Foundation. Longtime resident Dwayne Truss hopes CPS CEO Janice Jackson will ensure West Side students get the same opportunities for IB, STEM and other programs more commonly found in other parts of the city. The next round of job training classes start next month.